Give your project a voice! Without Text-to-Speech Module, Arduino TTS library makes it possible, voice synthesizer that converts a stream of digital text into retro (robot) speech. 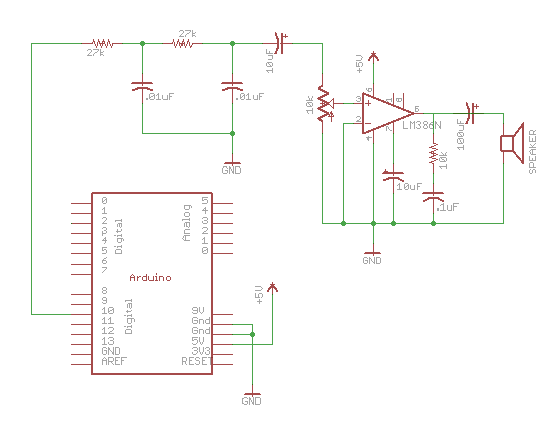 Its simple needs only external LM385 amplifier with arduino Uno, No special components or shields required. Thanks to Gabriel Petrut and Clive Webster for making this thing. Copyright (c) 2008 Clive Webster. All rights reserved. Nov. 29th 2009 - Modified to work with Arduino by Gabriel Petrut. to an RC filter then through an amplifier to the speaker. for queries and questions please comment..
existe versión de esta librería que convierta a castellano?